Painful ear infections seem to be a rite of passage for many children – by the age of five, nearly every child has experienced at least one episode. Most ear infections either resolve on their own (viral) or are effectively treated by antibiotics (bacterial). However, sometimes, ear infections and/or fluid in the middle ear may become a chronic problem that leads to complications such as hearing loss or behavior and speech problems. In cases where complications persist, insertion of an ear tube by an otolaryngologist — ear, nose, and throat surgeon — may be considered as a viable solution. Ear tubes (also called tympanostomy tubes, myringotomy tubes, ventilation tubes, or PE (pressure equalization) tubes) are tiny cylinders placed through the tympanic membrane — eardrum — to allow air to enter the middle ear. These tubes can be made of plastic, metal, or Teflon and may have a protective coating to help reduce the possibility of infection. There are two basic kinds of ear tubes: short-term and long-term. Short- term ear tubes are smaller and typically stay in place for six months to a year before falling out on their own. Long-term tubes are larger and have flanges that secure them in place for a longer period of time and may require removal by an otolaryngologist. Ear tubes are typically recommended when a person experiences repeated middle ear infections — acute otitis media — or has hearing loss caused by the persistent presence of middle ear fluid — otitis media with effusion. These conditions generally occur in children, but can also manifest in teens and adults which can lead to speech and balance problems, hearing loss, or changes in the structure of the eardrum. Other less common conditions that may warrant the placement of ear tubes include malformation of the eardrum or Eustachian tube, Down Syndrome, cleft palate, or barotrauma — injury to the middle ear caused by a reduction of air pressure, usually seen with altitude changes such as flying or scuba diving. Each year, more than half a million ear tube placement procedures are performed on American children, making it the most common childhood surgery performed under anesthesia. The average age of ear tube insertion is between 1 and 3 years old. Ear tubes are inserted by an otolaryngologist, during an outpatient surgical procedure called a myringotomy. A myringotomy describes the incision in the eardrum. This is commonly done under a surgical microscope with a small scalpel, but it can also be accomplished with a laser. If an ear tube is not inserted, the incision that is made would heal and close within a few days. To prevent this, an ear tube is placed to keep it open and allow air to reach the middle ear for ventilation. A light general anesthetic — usually laughing gas — is administered for young children who undergo surgery. Some older children and adults may be able to tolerate the procedure without any anesthetic. A myringotomy is performed where the fluid behind the eardrum is suctioned out. The ear tube is then placed into the incision is made. Ear drops may be administered after the ear tube is placed and may be necessary for a few days after the procedure. The procedure usually lasts less than 15 minutes and patients quickly recover from the anesthesia. Sometimes the otolaryngologist will recommend removal of the adenoid tissue — lymph tissue located in the upper airway behind the nose — during ear tube placement. Adenoid tissue removal is often considered when a repeat tube insertion is necessary. Current research suggests that removing adenoid tissue in addition to the placement of ear tubes can reduce the risk of recurrent ear infection and the need for repeat surgery. After surgery, the patient is monitored in a recovery room and will usually go home within an hour, as long as there are no complications. Patients usually experience little or no postoperative pain, but sleepiness, irritability, and/or nausea from the anesthesia can sometimes occur. Hearing loss caused by the presence of middle ear fluid is usually immediately resolved by the surgery. Sometimes children can hear so much better that they complain that normal sounds are too loud! The otolaryngologist will provide specific postoperative instructions for each patient, including when to seek immediate attention and follow-up appointments. The surgeon may also prescribe antibiotic ear drops for a few days to prevent infection. To avoid bacteria from entering the middle ear through the ear tube, the surgeon may recommend keeping ears dry by using earplugs or other water-tight devices while bathing, swimming, and other water activities. However, recent research suggests that protecting the ear may not be necessary, except when diving or engaging in water activities in unclean water including lakes and rivers. Parents should consult with the treating physician about ear protection after surgery. Consultation with an otolaryngologist may be warranted if you or your child has experienced repeated or severe ear infections, ear infections that are not resolved with antibiotics, hearing loss due to fluid in the middle ear, barotrauma, or have an anatomic abnormality that inhibits drainage of the middle ear. Eardrum perforation – This can happen when a tube comes out or a long-term tube is removed and the hole in the eardrum does not close. The hole can be patched through a minor surgical procedure called a tympanoplasty or myringoplasty. Scarring – Any irritation of the eardrum, including repeated insertion of ear tubes, can cause scarring called tympanosclerosis or myringosclerosis. In most cases, this does not cause problems with hearing. Infection – Ear infections can occur in the middle ear or around the ear tube. However, these infections are usually less frequent, don’t result in hearing loss, and are easier to treat – often only requiring antibiotic ear drops. Sometimes an oral antibiotic may be needed. Ear tubes come out too early or stay in too long – If an ear tube expels from the ear drum too soon (which is unpredictable), fluid may return and repeat surgery may be required. Ear tubes that remain too long may result in perforation or may require removal by the otolaryngologist. 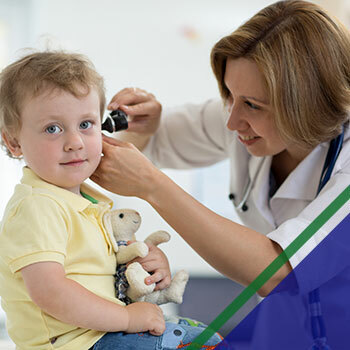 For an assessment for ear tubes for you or your child, contact the ENT specialists at Alpine Ear, Nose and Throat today!